When using the indicator a Buy Long position is opened as soon as the UP Arrow appears and a Sell Short position is opened as soon as the DOWN Arrow appears. The moving average line determines whether the arrows that appear will be UP or DOWN arrows. In other words if a buy long or sells short signal is determined by the indicator it will then check to see if the closing price of the bar is above or below the yellow moving average line. Only UP arrows will be plotted if the closing price of the bar is ABOVE the moving average line and conversely only DOWN arrows will be plotted if the closing price of the bar is BELOW the moving average line. The length of the moving average line can be adjusted in the input parameters in order to fine-tune the indicator to the behaviour and time frame, of the particular currency pair being traded. This is at the trader’s discretion as there are many combinations of chart time frames and moving average lengths that will create various desired results depending on the trader’s style of trading (scalping, daytrade, swing, etc), and risk-reward profile, as well as the differences in markets being traded, times of day/night, volatility, along with other factors. Before we go any further it’s important to understand how and where the arrows are displayed on the chart. The default setting will make the arrows appear on the OPEN of the bar that the trade is to be entered on. In other words as soon as the bar opens the arrow appears and the trade is entered on that bar. The alternative setting, which can be adjusted in the input parameters, can make it such that the arrows appear on the CLOSE of the PREVIOUS bar (the signal bar, just before the new bar opens). The trading difference is primarily a matter of visual preference (how the user wants to visualize the arrows on the chart), although the two different settings can make a slight difference as to when, and at what price, the trade is opened if the closing price and opening price of the bars on which the arrows appear are different, along with a few other factors. Again, the default setting is for the arrow to appear on the open of the bar that the trade is taken. If this seems confusing don’t worry once you watch the indicator in realtime it will make sense. 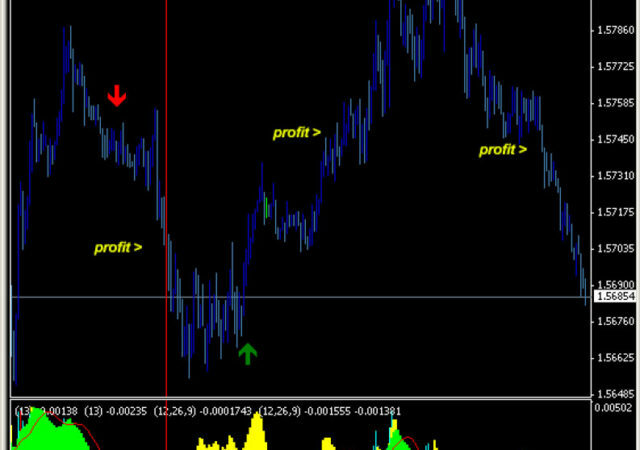 We encourage only observing or trading in a demo/simulated account in order to become familiar with the indicator. Once the indicator is set the way you want it you enter the trade, at your discretion, upon the up or down arrow appearing. Entering the trade is that simple.